This past Monday morning I dropped Laura off at her office downtown and headed into Red Deer County through a thick ice fog that had enveloped Red Deer and the surrounding area. I didn’t get far before I started to see the potential for some pictures. I slowed down along one of the range roads heading south as the fog was very thick, but when I get on backroads it’s what I tend to do anyway. As soon as I saw these trees I slammed on the brakes. They reminded me of Ray McSavaney’s pictures of the “Walking Tree” that he made in Yosemite National Park in the 80’s. I set up and waited until the fog drifted off a bit so I could see the front trees a bit better. It took a few minutes but I did’t mind. There was almost no wind and the fog was absorbing most of the sounds from around me. The quietness was very enjoyable! Ray McSavaney is one of my favourite photographers and his book “Explorations” should not be missed and better yet, be in your library! 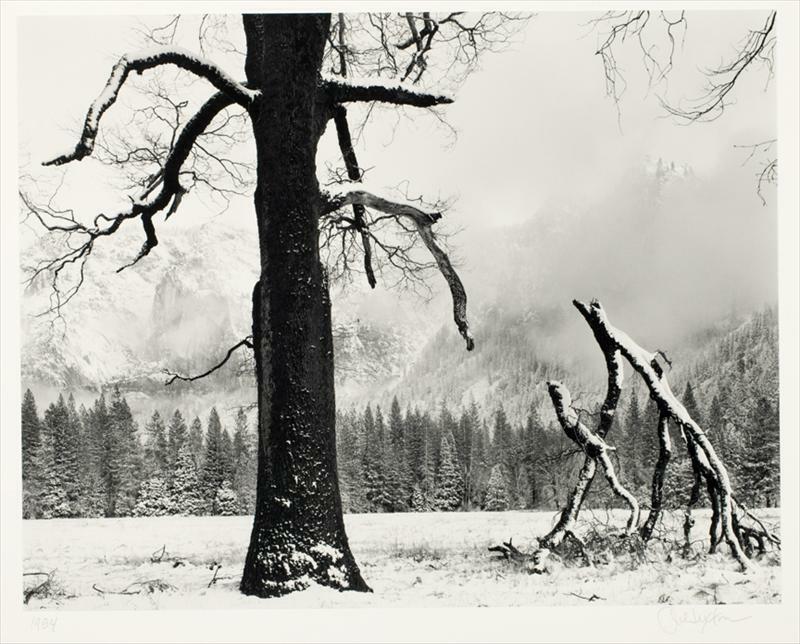 I believe it was Ray McSavaney that first found the tree he photographed in Yosemite, but John Sexton photographed the “Fallen Branch” beautifully as well. Speaking of books, you should likely round up copies of John Sexton’s “Listen to the Trees” and “Recollections”! Still Here, Alternatively – I’m Back! “It’s dead, Spalpeen,” Brian’s father said gently. “It happens to things,” his father said. “Why does it happen to things?” He turned up his face to his father, cheeks stained with drying tears. Autumn colours this year were quite beautiful, even though I didn’t capture a tonne (ton for those that still follow the imperial method of weighing things) of pictures. This one was made just as the woods made a last ditch attempt to impress those fortunate enough to walk the trails through them. It was a fairly windy afternoon and it was necessary to wait patiently for a spell of calm. I didn’t mind in the least, as it was still quite warm and looking around me wasn’t a bad way of spending some time. I spent a few hours slowly wandering around searching out the last few areas that were showing off. We have had more than our share of windstorms this year in central Alberta and as such thousands of trees have been lost. Maybe lost is the wrong term? They are now becoming part of the forest’s nutrition plan for the future! I have tried to find a way of showing the damage, but in a way that is still aesthetically pleasing. It can be hard to walk through Bower Woods and still appreciate them for all their beauty with so many toppled trees.